7 Best Fallout 4 Settlements: The Ultimate List 2018 (Updated!) | Nerd Much? 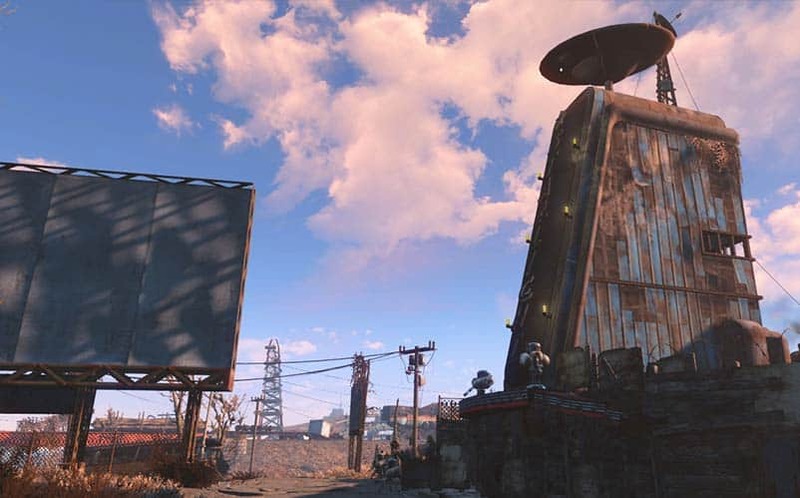 It’s hard not to be impressed by some of the best Fallout 4 settlements we’ve seen so far. Fallout 4 launched a little more than 3 years ago, and people playing the game immediately began going crazy with using the provided toolset to create some amazing feats of construction, not found anywhere else in any other game to date. A small, freely available mod called “Unlimited Construction” was used in most of these creations, but that doesn’t make them any less impressive. The Starlight Movie Theater is one of the first Fallout 4 settlements that you’re asked to liberate, after you join up with the Minutemen. Once you do so, you find out that it is nothing more then a small bar and yard full of car wreckages with a radioactive pool of water in the middle of it. Oh, and there’s just one lone settler living there. It turns out, that you can actually create an entire city out of this desolate piece of land, as K4SHMOR3 has done. What he created is a completely walled-off and defensible city, which has everything a wasteland dweller would need: a bar, to rest after those hard hours out in the wasteland, along with a clinic and a water purifying plant. To top it all off, Starlight now sports a gigantic, overlooking tower. The Red Rocket Garage is a really lonely place when the player first encounters it in the main game. Sure, this is the place you meet your first companion, Dogmeat, but apart from that, it is a Molerat infested garbage dump. 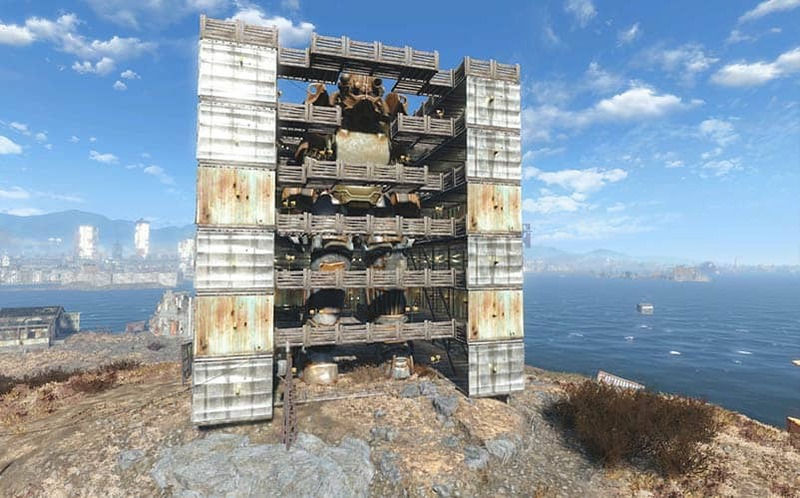 One creative player has completely changed the Red Rocket Garage into a comfortable place for any Wastelander out there. 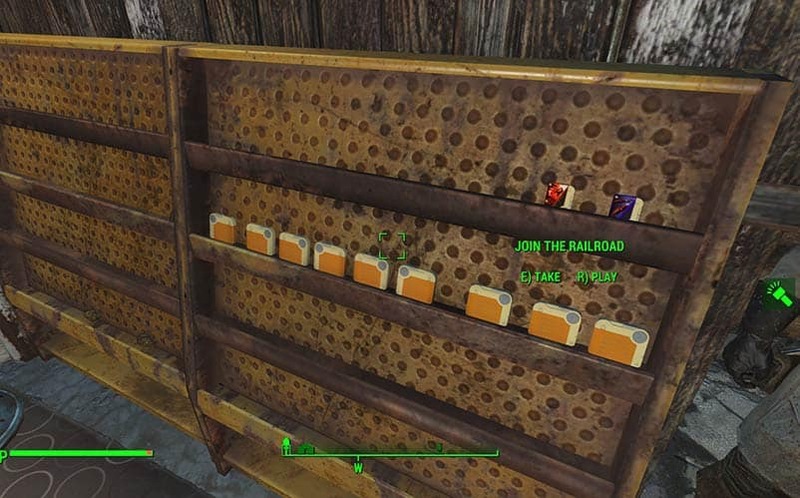 The Red Rocket redux has a full Nuka-Cola vending machine, along with multiple magazine racks, a ton of food and almost all of the entertainment holotapes found in the game. Now that is comfortable in my book. Sanctuary Hills, being the first settlement you visit after emerging from your Vault, is not really much to look at. Inhabited only by your former robo-butler, Codsworth, and full of ruined houses, it was just asking for an overhaul. So when CloakedWarrior4323 posted his take on the settlement to reddit, our jaws dropped. The player made the town at least three times bigger than it was, even before the war. 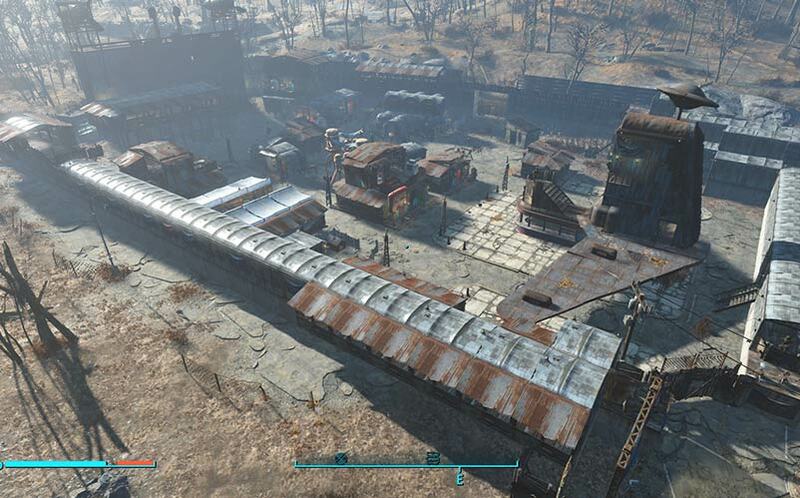 Sanctuary Hills now sports a huge wall surrounding the entire town, along with massive defenses and even an Inn, with its own pool table and lots of beverages. 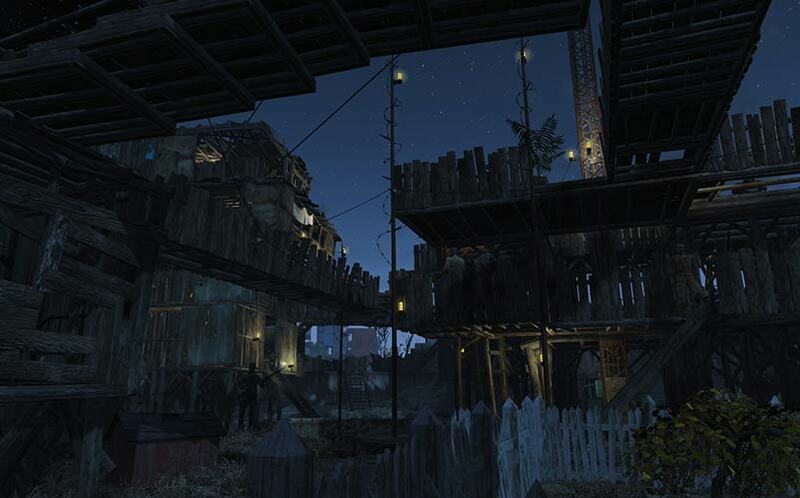 While many custom made Fallout 4 settlements out there are really impressive, this one has to be among the best. You probably remember the giant Death Robot that the Brotherhood of Steel had in Fallout 3. Well, one intrepid gamer has decided to build his own version of it, in the form a gigantic power armor suit. 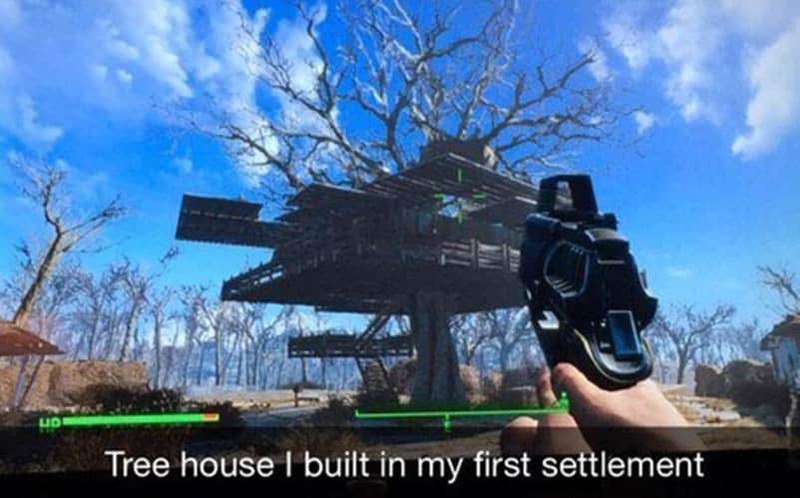 And not only that, but he built a gigantic power armor bay as well, to house the suit. And all of this, using in-game resources only. Pretty awesome. This really cool looking and extremely creative treehouse is one of the best on this list. 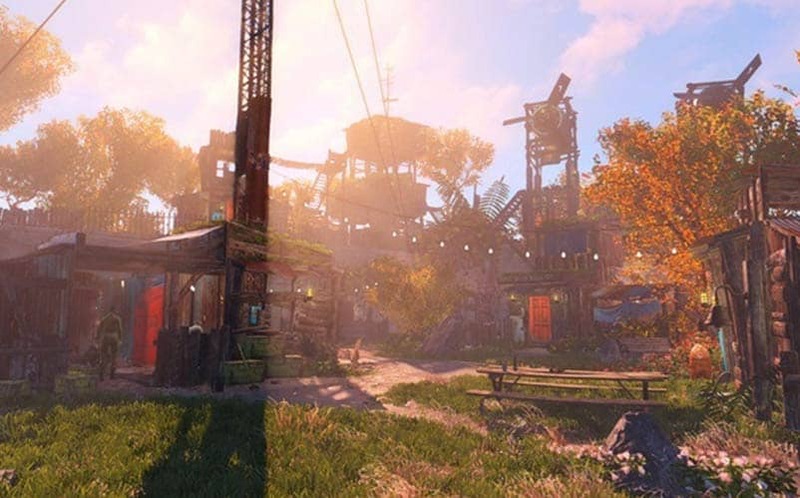 While it is not a proper settlement or town, it is still unbelievable that a player could build a gigantic treehouse in Fallout 4, and honestly, we’re a little upset that we weren’t the ones to think of it. 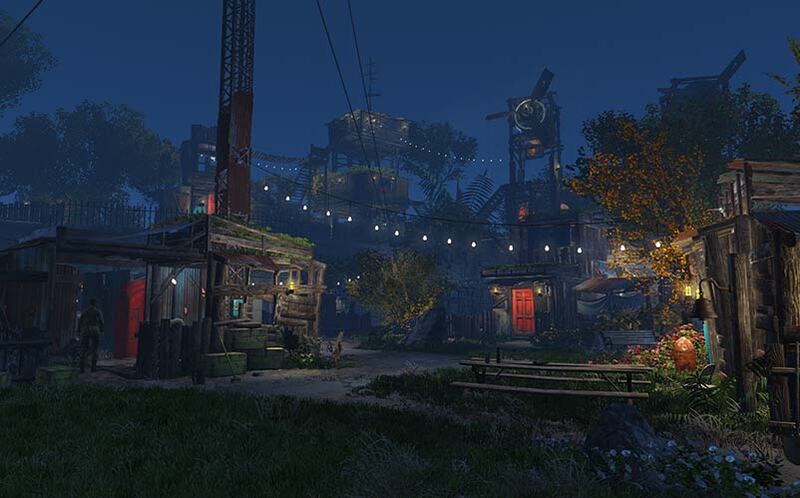 Among the coolest Fallout 4 settlements created by the community, is this one: Bliss City. A beautiful and serene place, with lots of grass and vibrant colors that make us forget that we’re actually in a post-apocalyptic game and that the nuclear holocaust happened. Every building is built from wood, there are trees everywhere, and the town even has a custom crafted windmill. It’s the perfect place for any weary wasteland hero to relax with a few beers and feel safe. After re-conquering the former stronghold of the Minutemen, and beating a really hard boss to do so, players gain access to The Castle, a crumbling ancient stronghold. While The Castle, itself, is really not much to look at, another creative gamer has managed to completely restore the place into something to rival even Diamond City. Two-storied houses, bridges and completely restored walls are just a few of the features of the new Castle. Now, it really feels like the invincible stronghold of the Minutemen.